A little over a week ago, my Algebra 1 students took their test over graphing linear equations. This test covered finding slope, x and y intercepts, graphing linear equations, and converting between standard form, slope-intercept form, and point-slope form. The test scores were disappointing. As long as equations were in slope-intercept form, my students did pretty well. But, if they had to rearrange the equation in order to solve it, they would rather guess an answer than try to get y by itself. We had spent days on both standard form and point-slope form. We had created foldables for each. And, they had seen lots and lots of practice problems. They were even allowed to use their interactive notebooks on the test. But, somewhere along the way, I had failed my students. Looking back, I realize that my students had never really had to learn what form of an equation they were dealing with. I would tell them that we were working with standard form that day or point-slope that day. That would tell them what page in their notebook to reference. On the test, however, all of the forms were jumbled up. I had not given my students practice determining what form an equation was in. I especially realized this when helping students with test corrections. I learned how to do test corrections from my cooperating teacher at the middle school level during my student teaching. He set up test corrections in such a way that students had to think through the problems they missed. They had to actually discuss math. Then, they have to express either their mistake or what they have learned in writing. And, the results were priceless. The group set-up for test corrections actually hasn't worked as well for me in my classroom since I have such small classes. Usually, I love, love, love my small class sizes. But, this is one activity where it is better to have twenty-five or thirty students in a room. During test corrections, students would constantly be raising their hand and asking me to help them with a problem. I heard "I don't know why I got this one wrong because I just guessed" way too many times. First of all, the logic of that statement does not make sense to me. You got it wrong because you guessed. Anyway, my first question would almost always be "What form is this equation in?" I heard way too many "I don't know" responses. Eventually, I would be able to coax an answer from them, but it was a frustrating process for both of us. When I look at a linear equation, I immediately try to classify it. My students don't have this intuition. The fact that we need to do this is something I should have taught them. Next year, I will know this from experience and will do better! While reviewing for the semester test, I decided to take some of the time and review the types of linear equations. While browsing an antique store last weekend, I saw some flyswatters that had been decorated with fake flowers. The sight of these flyswatters brought back fond memories of the flyswatter game that I used to play in middle school. The flyswatters I used for the Flyswatter Game. 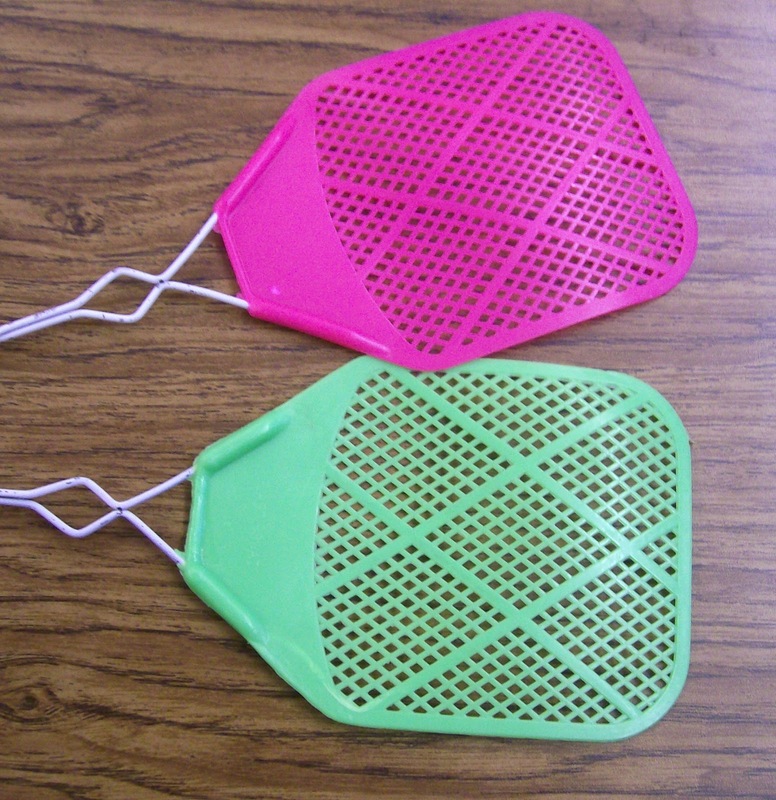 The premise of the flyswatter game is simple. On a dry erase board or sheet of large paper, write out all of the vocab words for a lesson, chapter, unit, etc. Form two teams. One person from each team takes the flyswatter and stands on a line in front of the words. (It's your decision whether students will start by facing the reader or the words.) Read a definition. (You could also project it on the screen.) The first student to swat the answer with their flyswatter gets to stay in the game. They will go to the end of their team's line. The other student will be out. (If both flyswatters land on the same answer, the one on the bottom wins.) The game continues until only one team remains. 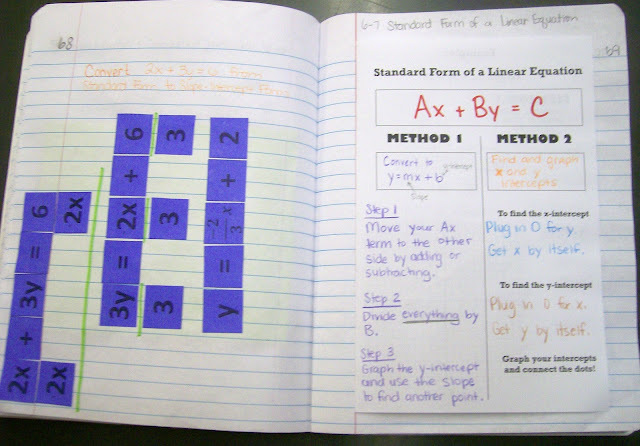 I wanted my students to have more practice determining what form a linear equation was in. I also wanted to re-emphasize how to recognize the equations of horizontal and vertical lines. My categories were: Standard Form, Point-Slope Form, Slope-Intercept Form, Horizontal Line, Vertical Line, and None of These. I prepared a Smart Notebook file of 30 or so linear equations. After each team sent up a member, I would project a new equation on the Smart Board. Students would have to determine what form it was in and swat the correct answer. Where the Swatting Occurred. My dry erase board does not photograph well, apparently. I'll be honest. The game didn't work out as well as I had hoped. The problem wasn't with the game, though. The problem was that I still had implicitly instructed my students how to determine what form a linear equation was in. This led to many students just swatting random answers. I still have so much to learn as a teacher! All of the teachers in my school are supposed to do semester tests on set days. Yesterday, we did semester tests in our odd-numbered hours. Today, we tested in even-numbered hours. Some of my students were a little confused by the odd/even distinction. They mistakenly thought the day you tested on was determined whether there was an odd or even number of students enrolled in the class. Once we got that cleared up, it went pretty smoothly. The only problem I have with the whole arrangement is that I still have my odd periods for 3 more days and my even periods for 2 more days before the semester ends. It's not enough time to start a new unit, but I'm not one to let my students do nothing. They know this about me. I passed out evaluation sheets for my students to fill out, and a lot of students answered "more free time" to the question "What changes do you want to see next semester?" That's definitely not going to happen. Today, my classes that were finished with their semester tests, filled out the evaluation forms and explored the exciting world of hexaflexagons. Then, I passed out blank trihexaflexagon templates from puzzles.com. This website has two versions available. One template is larger and includes only the template. The other template is smaller, but it also includes the assembly instructions. I printed off the second template for myself and the first, larger template for my students. Now, if I was a geometry teacher, I would definitely use the information available in this tutorial to have my students use a ruler and compass to have students construct their own hexaflexagon templates. How awesome of an introduction to geometric constructions would that be?! The directions on the second template are well-written, but my students are not the best at following directions. I found it easier to show my students what to do using the document camera than having them try to follow written instructions. I did have my students number their template as shown in the instructions. This way, I could tell my students exactly what numbers should be showing at any point in the construction process. If a student's numbers did not match mine, it was obvious, and we could work to fix the problem immediately. I learned after my first class to make sure I told students to crease each fold BOTH ways. 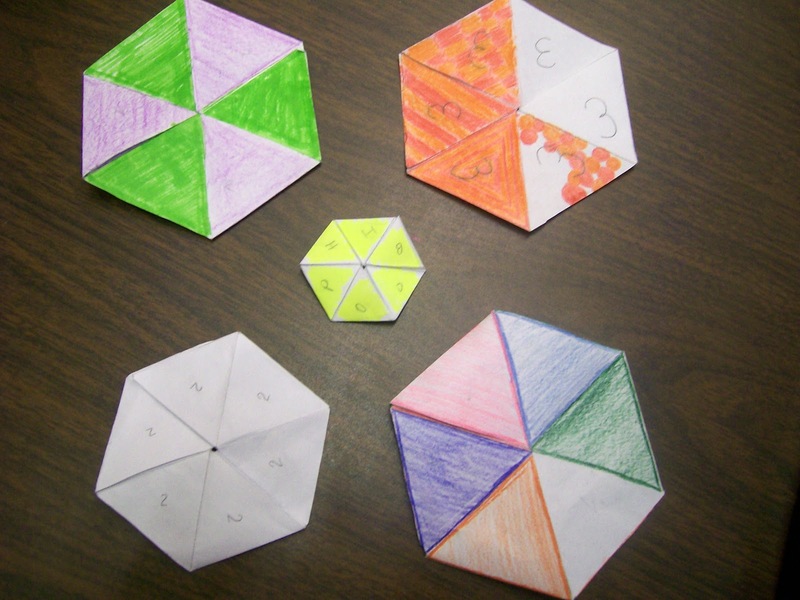 Otherwise, my students had a lot of trouble making their hexaflexagons work since the creases were weak. After cutting, folding, and gluing, my students were eager to flex their hexaflexagons. After many one-on-one lessons with students to show them where to pinch and open, the room was abuzz with excitement. Students used the rest of the class period to color their hexaflexagons. Since my junior year of college, I have been blogging about teaching math. However, I've kept it a secret. Every once in a while, someone would tell me that I should start a blog. I would sort of smile and nod, knowing that I was already blogging about it. Over the past few weeks, I stepped out of my comfort zone and told two people about my blog. It was a big step for me. Today, spurred on by Dan Meyer's public service announcement, I am proudly writing my name on my blog. I am proud of what this blog has become. I love that it captures both the good and the frustrating since teaching truly is a mixture of both. I believe that my blog is a reflection of my dedication to my students, my school, and this profession. So, starting today, I am proudly proclaiming that these words belong to me. 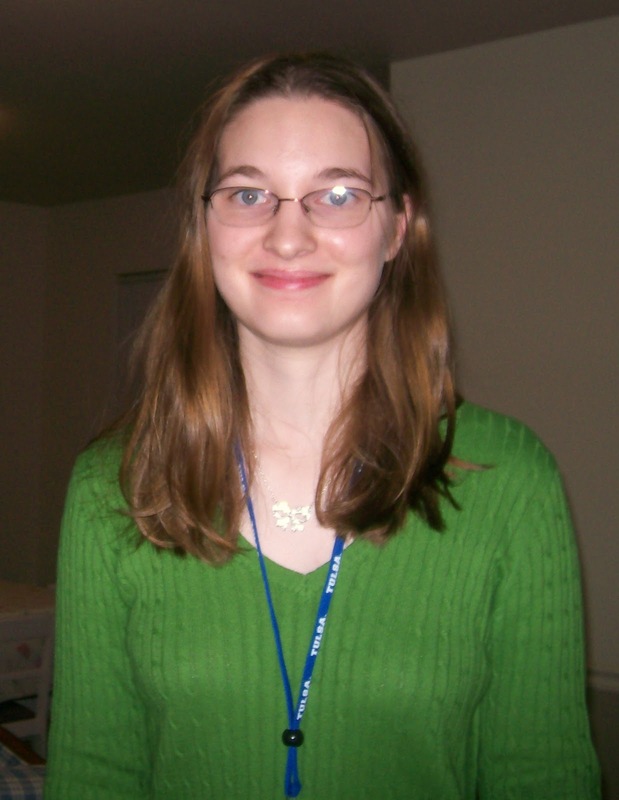 My name is Sarah Hagan, and I am a first-year high school math teacher. I teach Algebra 1, Algebra 2, and College Algebra in a small, rural town in Oklahoma. Adjusting to life in a town without a single stop light or even a Wal-Mart has been an interesting experience. I am a proud graduate of The University of Tulsa. There, I studied mathematics and secondary education. The tools I was equipped with to work with students in an urban environment translate almost perfectly to the students I now teach in a rural environment. I would love for you to join me on Pinterest or Twitter (@mathequalslove)! Well, today was the last Saturday School of the semester. And, it was my most productive Saturday School yet. When I agreed to supervise Saturday School, I was pretty excited that I would be getting paid to do work that I would normally be doing on Saturdays, anyway. Well, that and supervising students who needed to make up absences. Keeping teenagers busy who don't want to be there and don't have anything to work on is a full-time job, however. Today, while they were busy with word searches, books to read, essays to write, math questions to solve, and coloring sheets to keep them busy, I got caught up on all of my grading! 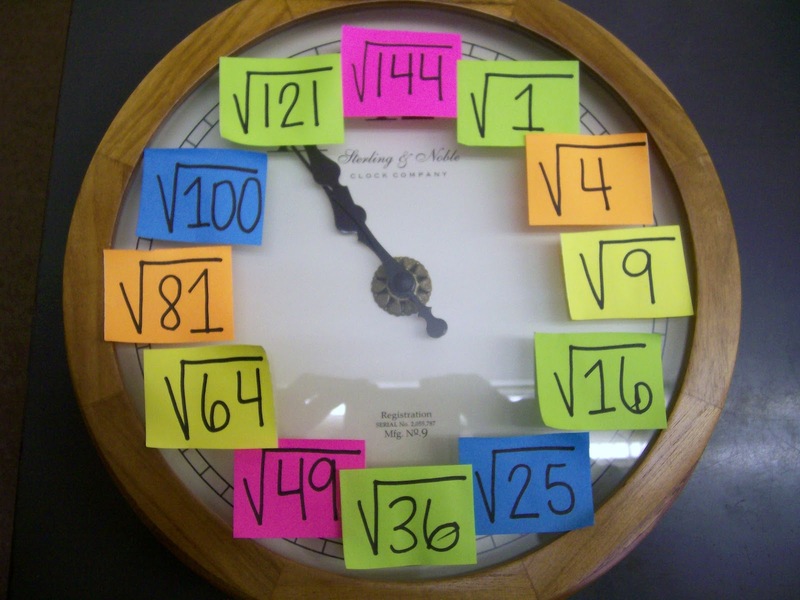 I even had time to transform my classroom clock. This was inspired by a pin uploaded by Bethany Pearson. When we get back from Christmas Break, my Algebra 1 students will be starting to study exponents and radicals. I thought this would be a fun way to preview the topic of radicals. It even sparked a great conversation in Saturday School. One student said that it was easy to figure out what number it was because you just divided by two. Some other students quickly jumped in the conversation to correct him. I'm so excited to see my students' reactions on Monday! Another exciting piece of news: my manual pencil sharpener is back in action! A few weeks ago, the handle to my pencil sharpener went missing. I assumed it had been stolen. It wouldn't be the first time a student has stolen something from my classroom. Earlier this year, I had a student steal a bell off of my desk. When a student told me who stole it, I tracked down the student, and t\he gave it back to me. But, a few days later, it disappeared again. Months later, it has still not returned. Anyway...back to the pencil sharpener. A student went to use it today, and he immediately started questioning me about why the pencil sharpener wouldn't work. I told him that someone had stolen the handle, and he would have to use the electric pencil sharpener instead. For some reason, he proceeded to take apart the manual pencil sharpener. Inside the part of the sharpener that usually holds the pencil shavings, he found the missing handle. Now, why in the world would someone feel the need to dismantle my pencil sharpener and hide part of it inside it? Oh well, I'm just happy to have it back in service. Instead of designing a foldable for one of my future units, I created a foldable for a past unit. I've had several visitors come to my blog after searching for an ordered pair foldable. I hadn't made an ordered pair foldable, but seeing the search term inspired me to create this foldable. I apologize that the pictures are not super-high quality. Sometimes I wonder how my students describe to others what we are learning in Algebra 1. Yesterday, I ended up giving impromptu lessons over article adjectives and what it means to plead the fifth. We do talk about math, I promise! Me: "We don't always write out article adjectives when taking notes." Student: "What's an article adjective?" Student: "Are we your favorite class?" Me: "I plead the fifth." Student: "So, fifth hour is your favorite class?" I care about my students. I care about how they do in my class. I care about how they are doing in other classes. I care about their futures. A few months ago, I ordered a copy of Inspiring Active Learning by Merrill Harmin. It has become one of my most used resources for effective teaching strategies and inspiration. My copy of the book is slowly being filled with highlighting, underlining, and notes in the margins. This book has opened my eyes to how students perceive my actions. I wish this is what was taught in my teacher education program. "High expectations are signs that you strongly care. When you give up on students or accept halfhearted work, you tell students that you do not care about their welfare all that much." Guilty. Last week, I covered parallel and perpendicular lines with my Algebra 1 students. 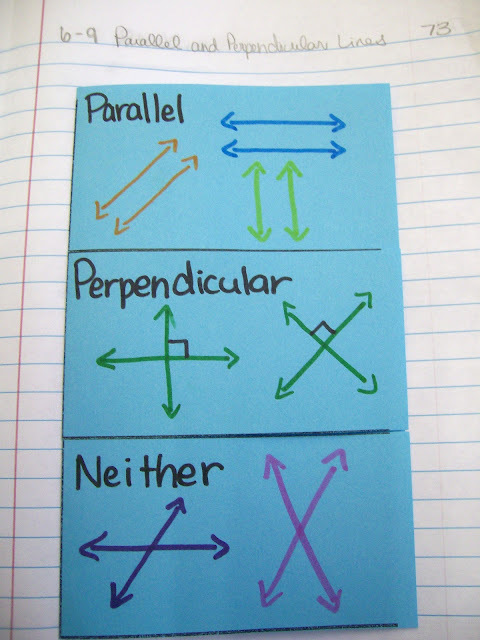 We discussed what parallel and perpendicular lines looked like. We discovered the relationships between their slopes. We practiced identifying parallel and perpendicular lines by looking at their equations. 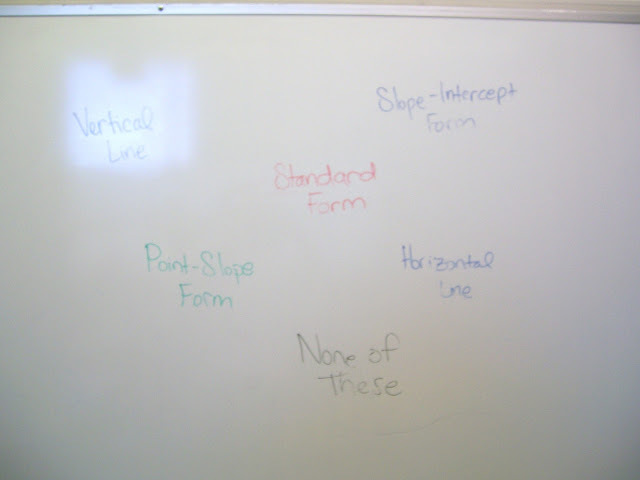 We used the slope formula to find the slopes of various lines in order to determine if they were parallel, perpendicular, or neither. Two of the last problems on the worksheet asked students to determine if a given pair of lines was parallel, perpendicular, or neither. However, they gave the students the lines in standard form instead of slope-intercept form. My students are really struggling with converting lines in standard form to slope-intercept form. I mean REALLY STRUGGLING. The majority of my students came to me with little to no background in integer operations or inverse operations. 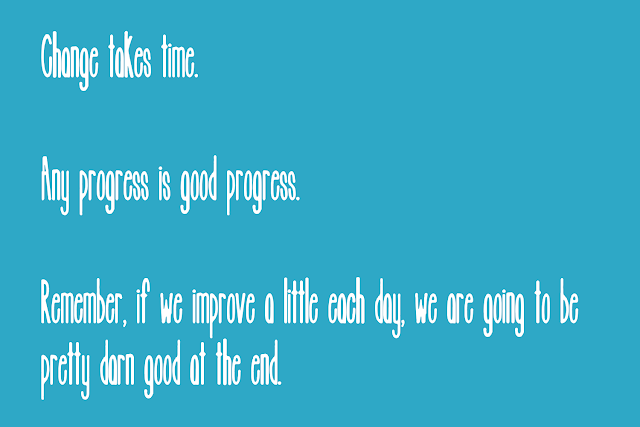 I have tried to fill as many gaps as possible, but some of my students are still struggling. This makes rearranging equations frustrating for them and for me. As I helped some students work through these challenging problems, other students were listening. They weren't listening for the solution process, but for the final answer. Oh, number 14 is parallel. I knew this was going on, and I did nothing to stop it. When I graded those worksheets, I felt terrible. These students were getting a grade for work they didn't do. I was rewarding them for cheating. High expectations were not present that day in my classroom... And, it's this sort of thing that makes me want to adopt standards based grading in my classroom. "When we can radiate our best selves in the classroom each day, we naturally elicit the best response from students...This inspiring power is especially intertwined with our ability to be caring." After reading this passage, I wrote the following in the margin: "Convicted. No more bad days. Ever." I am human. I have great days and not so great days. I am guilty of getting frustrated with one of my class periods and letting that frustration carry over into later class periods. This is not right. My students deserve me at my best each and every day. It shouldn't matter how I feel, what day of the week it is, or how my 3rd hour acted. I don't have the answer for how to make this happen, but I'm taking the first step by reflecting on and making myself aware of the problem. After several conversations with one of my students, I have started forcing myself to smile some days when I don't feel like it. And, you know what? Sometimes that simple act is all it takes to start changing my attitude and outlook on the rest of the day. This year, I am the algebra teacher in my school. I teach Algebra 1, Algebra 2, and College Algebra. The only math class I don't teach is geometry. Our other teacher teaches all of the geometry classes and two hours of Algebra 1. Initially, I was glad to not be teaching geometry since I haven't had much experience with it other than taking geometry in high school. However, as the year progresses and I find myself helping students with their geometry homework, I'm realizing just how fun of a class it would be to teach. I look at their homework and start imagining all of the possibilities for foldables and hands-on activities. Last weekend, I spent some time looking through all the pictures I had taken during the past year. I ran across some pictures I had taken to put in my online portfolio that I created during my job search. This was one of those pictures. For my methods of teaching class, we had to write a specified number of lesson plans. Each lesson plan had to follow a strict format and include examples of what the completed activities or assignments should look like. One of the lesson plans I wrote focused on applying the formulas for area and circumference of a circle. 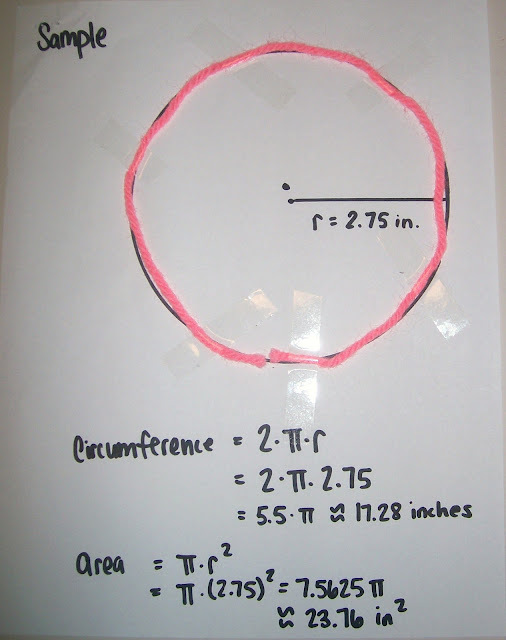 The idea behind the lesson was that students would use materials to verify the formula for circumference of a circle. I would gather circular objects for my students to use to trace circles. After tracing around a circle, they would estimate the center of each circle and draw the radius. Using a ruler, students would measure the radius and use the formula to find circumference. After arriving at an answer, students would use a ruler and scissors to cut off a piece of yarn the length of their circumference. They would then lay the yarn around the circumference of the circle to verify their answer. If the piece of yarn was too long or short, the students would need to verify their measurements and find their mistake. I think this would be a great way to show students that the circumference formula is more than just a jumble of letters. I haven't used this in my own classroom, though. Today has been a day full of parallel and perpendicular lines, a student council meeting at lunch, practice ACT questions, after school math tutoring, and lots of crazy conversations. Enjoy. Student: "Can I go to talk to the principal?" Me: "He's not here today." Student: "Why? Where's he at?" Me: "He's at a workshop." Another student: "Is he at Santa's workshop?" "How can vegetarians eat sandwiches?" Student: "So, what do you think? Can I get some extra points for it?" Student: "I was hoping that you would give me thirty extra points for it." Me: "This is from last year. It's not for this class. I'm sorry, but I can't give you any extra credit for having last year's assignments." Student: "I was hoping that if I kept it that I would get some extra points for it. That's okay. I'll take it to [the other math teacher.] He'll give me some extra points for it." Me: "But, he's not your teacher. How will he give you extra points?" Student: "That doesn't matter. He can still give me extra points." "Guys, it's three days until Hanukkah. I know this because I asked for a dreidl for Christmas." Today, I introduced the concepts of parallel and perpendicular lines to my Algebra 1 classes. Quote of the Day: "I'm going to name my kid 'Perpendicular.'" 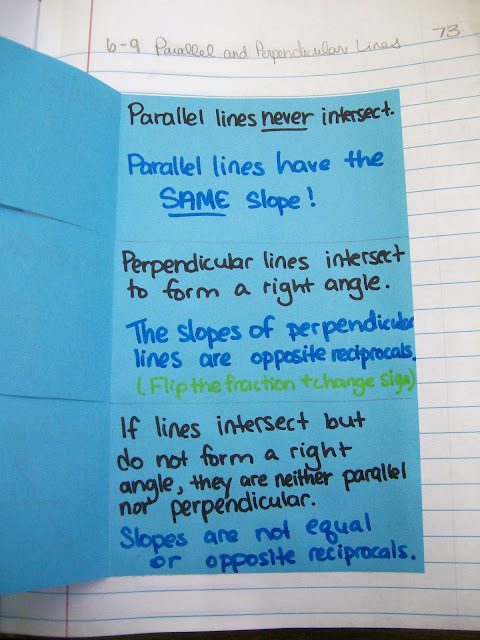 I had my students complete this foldable for our interactive notebooks. I'm not the biggest fan of what I had my students write inside the foldable. It was a little wordy, and I will tell you that the amount of writing decreased with each class period that I taught this. I put this together at the last minute, and it shows. Next time I cover this topic, I will revisit this and revise. Any advice would be greatly appreciated! Well, the student from the other day who told me that I looked like I hated my life commented again on my appearance today. When I greeted him before lunch today, he noted that I was actually smiling today. During my interview for this job, the superintendent told me not to smile until Christmas. I'm glad I didn't follow his advice because I truly believe that my students need to see me smile. My students need to see that I want to be doing this job, that I want to be where I am at the moment. Today's post is about some of the little things I've been doing help bring a smile back to my face. 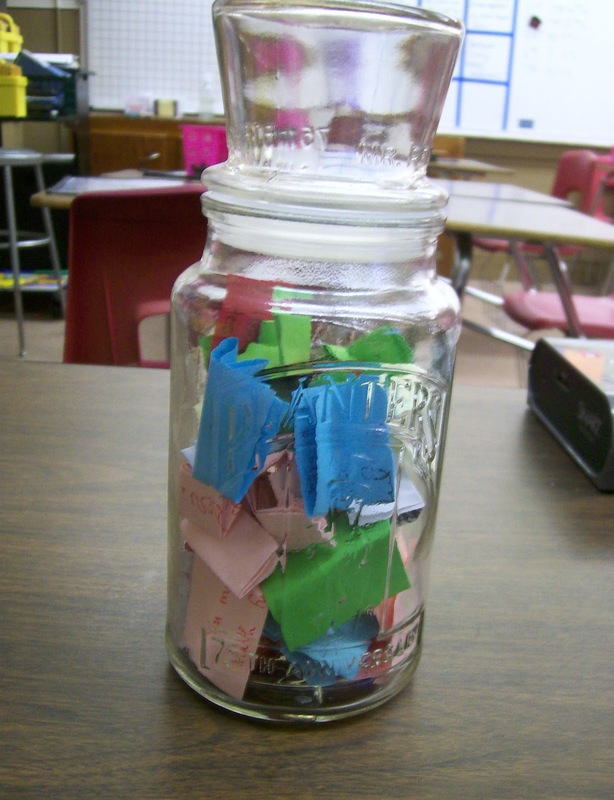 I've also been making a concerted effort to add memories to my memory jar. I ran across this idea on Pinterest this summer, and I decided I needed to make one for my own classroom. When I asked my mom for a jar that would work, she gave me a Mr. Peanut jar. It sets by my desk, and whenever a students says something funny, profound, or somewhere in between, I write it down on a post-it note, fold it up, and put it in the jar. This jar is full of the things that make me love my job. But these are the exact same things that are often forgotten or overlooked when reflecting back on my day. My mind tends to focus its attention on that thing that didn't go so well instead of the myriad of other daily events. I think my plan is to read these at the end of my first year of teaching. I can't wait to read back over all of these memories and relive my first year of teaching. I used to journal a lot, but I just haven't had the time of late. Basically, if it doesn't get written here or jotted down on a post-it note and stuck in my jar, it doesn't get written down. 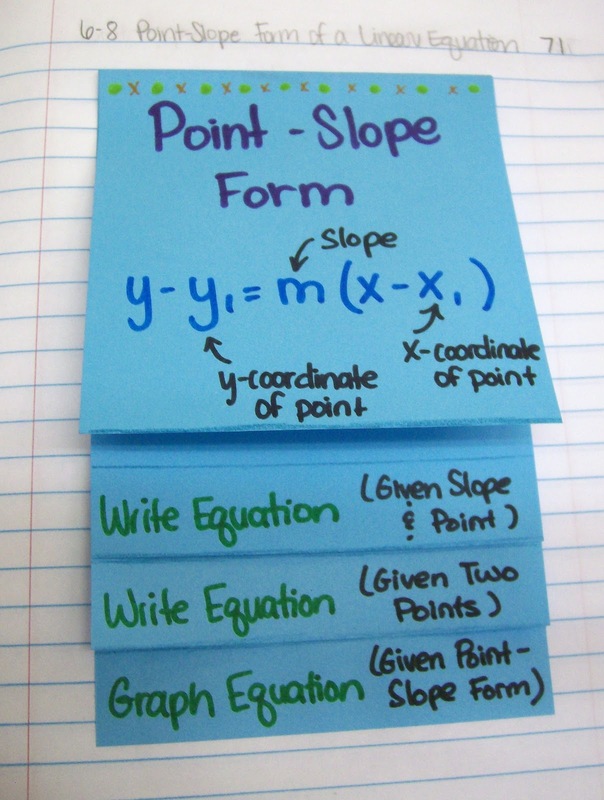 Today, my Algebra 1 students learned about point-slope form. This is the third and final form of a linear equation we will cover. At first, my students were apprehensive about the new formula, but they quickly warmed up to it. Today, we focused on writing equations in point-slope form and finding the slope and coordinates of the point from the equation. 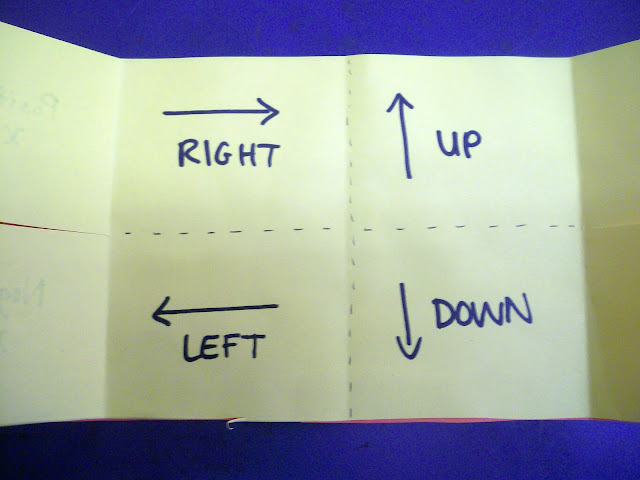 Tomorrow, we will review this and create the following foldable. Then, I hope to spend the rest of tomorrow's class period reviewing once again how to rearrange equations to slope-intercept form. My students are really struggling with rearranging equations. I have a few who get it, but the rest seem to always divide when they are supposed to add or subtract and vice versa. We've talked about following the order of operations backwards. We've taken notes over it several times under different scenarios. But, nothing seems to make the process click for my students. As a first year teacher, it is easy for me to feel overwhelmed. I look at my students, and I see how much of an education they have been cheated out of without their even realizing it. I see the extra obstacles that will lie in their paths toward success if I can't help each and every one of them pass their EOI test in April. I hear their heartbreaking stories from other teachers. There are days that I feel like I am not making a difference. The EOI test is in April. For most of these students, graduation is a few years off. But, these students are in my classroom TODAY. I need to learn to focus on them and what the current day holds. Lately, I've been focusing more on the things I can't control than the ones I can. Then, I allow my frustration change my attitude and my outlook. I hadn't really been aware of this shift in my thinking and my focus until last week when a student told me something I will remember for a long while. Every day, this student puts his bag in my room before lunch since he has my class after lunch. And, every day I tell him hi and/or ask how he is. Last week, I don't remember if I actually said "Hi" or not. But, he told me that I looked sad. When I questioned him about it, he told me this: "You used to always look so happy when I came in the room, but lately you look like you hate your life." I don't hate my life. And, I certainly don't hate my job. I love that I get to spend my days teaching my students about math and life. But, I hate that I can't change how my students choose to view themselves. I hate that I can't change my students' past experiences with math or school in general. I hate that I don't know how to bring about change in this school. And, I hate that the process of change is such a slow one. I know exactly where my frustration lies, but my students don't. I need to focus on doing my job to the best of my ability and hope that others choose to follow me. I e-mailed my the middle school teacher that I student taught with last week, and he wrote me back some words of wisdom. They resonated with me so much that I made them my desktop background. My goal for this next week (and the rest of my career) is to focus on my students. There will always be things I cannot control. I must try to bring about the change I believe in, but I cannot allow my success or lack thereof in that arena to define my attitude. 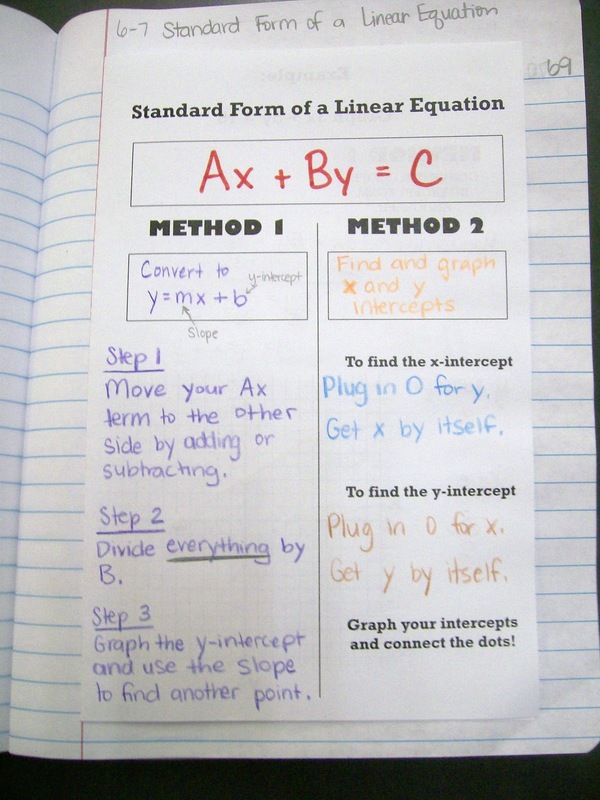 Last week, my Algebra 1 students worked with linear equations in both slope intercept form and standard form. 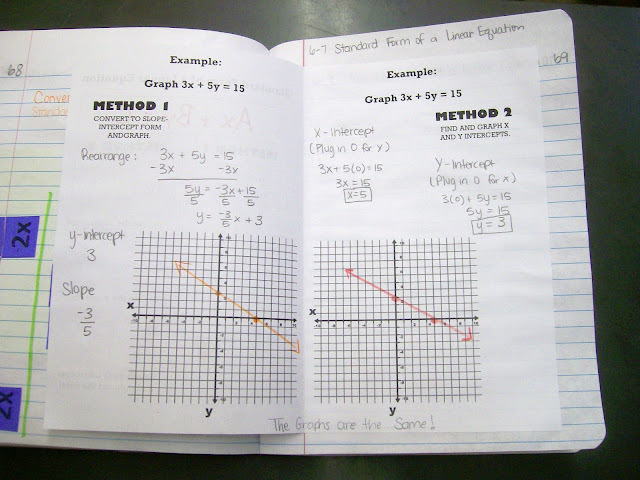 We practiced graphing equations in standard form by converting to slope intercept form and by graphing intercepts. At first, my students did not like graphing intercepts. However, after several problems, that became their method of choice. Here are pictures of our Interactive Notebook entries over Standard Form. 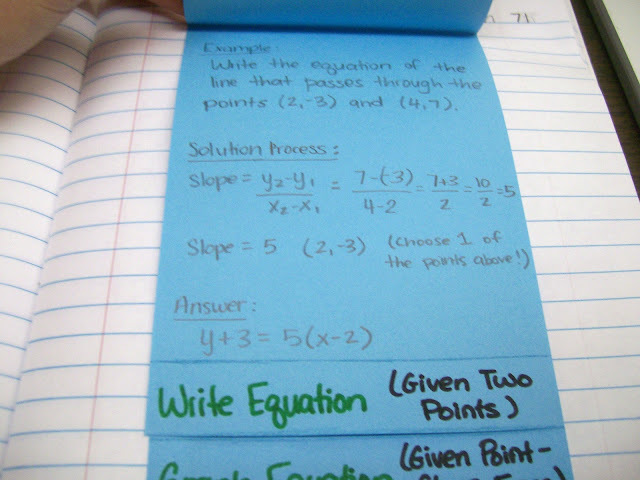 On the right, I created a mini-booklet of sorts to help students organize their notes on standard form. I wanted students to know exactly where to look for the steps in solving and where to find a completed example. Here is a picture of our completed "book" after being glued in our composition notebooks. On the inside of the booklet, we solved the same problem using both methods. 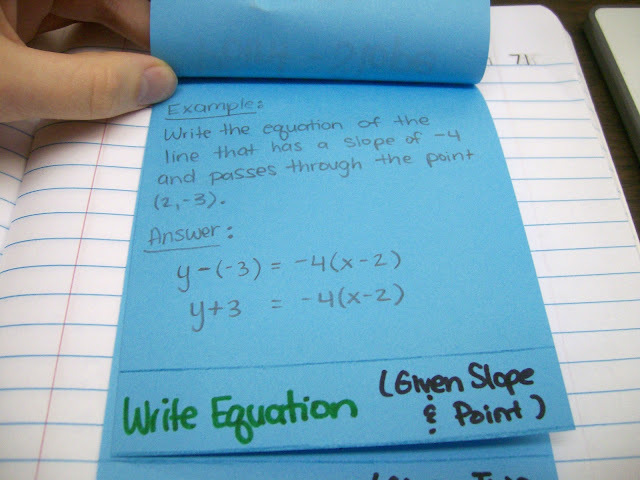 This note-taking template (or book or foldable or whatever you want to call it) is available as a PDF for your use. Print it double-sided and have students glue the blank side into their notebooks. I would suggest writing on it before gluing it in your notebook! 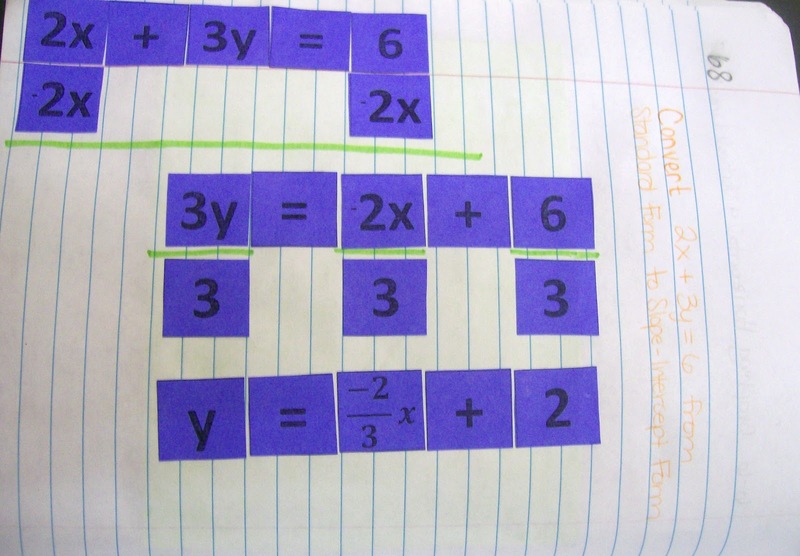 On our left hand page, I created a cut and paste activity for my students to complete. I chose a equation in standard form that I wanted them to practice converting to slope intercept form. I printed each element in the original equation, new equation, and solving process in a square. Students were supposed to cut out the pieces, form the equation projected on the Smart Board, and use the remaining pieces to convert the equation to slope intercept form. I had several goals in doing this. I knew some of my students would benefit from actually manipulating the pieces of the equation. Students knew that they were supposed to use all of the pieces. When students had leftover pieces, it led to some great conversations about common mistakes. 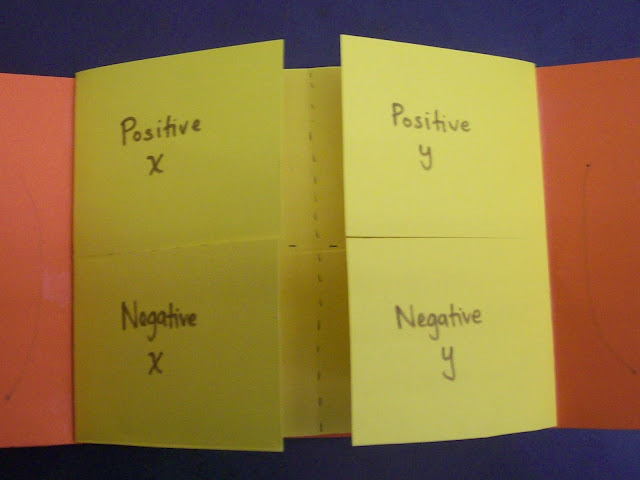 For example, some of my students hadn't been dividing EVERYTHING by the coefficient of y when getting y by itself. The activity was actually really frustrating for me, though. I had assumed we would be able to complete it the same day that we completed the above notes and practice problems. However, we were running out of time, and I chose to give my students their sheet of practice problems in lieu of the cut and paste activity. The next day, we did the cut and paste activity. I thought this would take five or ten minutes. I was wrong. Very wrong. We spent almost half a class period working on this. The 20 pieces were time-consuming to cut out and even more time-consuming to glue in their notebooks. 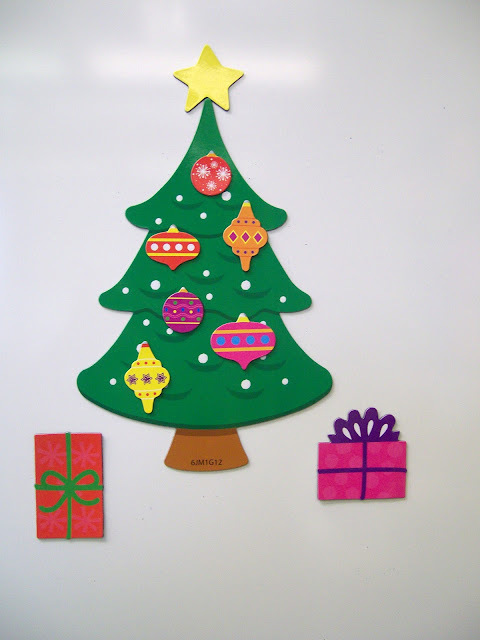 I have uploaded the pieces for the cut and paste activity if you would like to use them. In retrospect, this would have made a better stations activity than interactive notebook entry. I think next time I teach this I will make up 5 or 6 equations, cut them out in pieces and put them in envelopes. Students will circulate through the stations and manipulate the equations to convert them to the correct form. 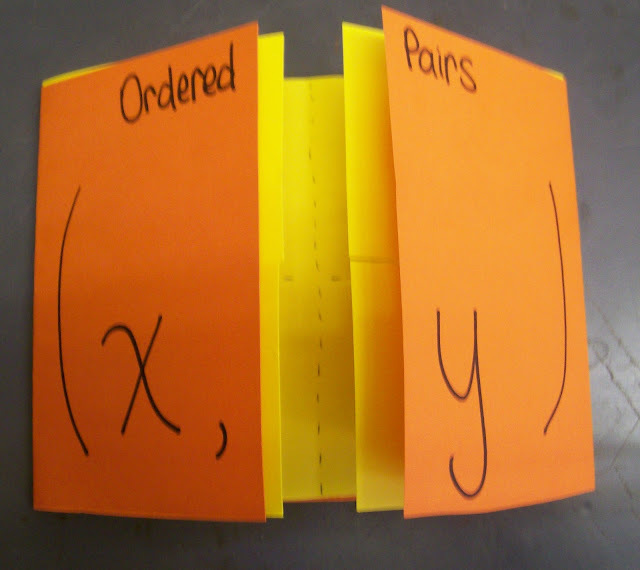 This will focus my students on the solving process instead of the cutting and gluing. And, this is what I love about blogging. I considered not even sharing this activity since I found it to be ineffective in my classroom. But, through this process of writing and reflecting, I have learned from my experience. It may not have been the most effective use of time in my classroom, but it was not a waste of time. The experience has made me a better teacher. No, that is not true. Reflecting on the experience has made me a better teacher. Every lesson, every activity will not be a home run. But, if I take the time to reflect on them and learn from them, I am doing my students the best service possible. I'll close this post with a picture of our completed notebook entry.